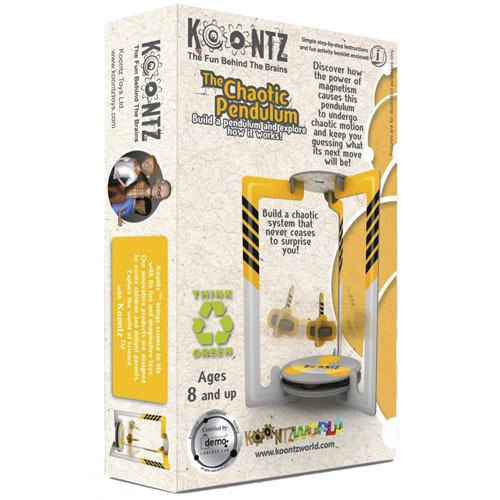 Easily assemble this chaotic pendulum without tools from strong, pre cut durable and recyclable cardboard parts, string and magnets. Swing the suspended magnet, and watch the chaotic movement unfold. Create your own beautiful chaos. 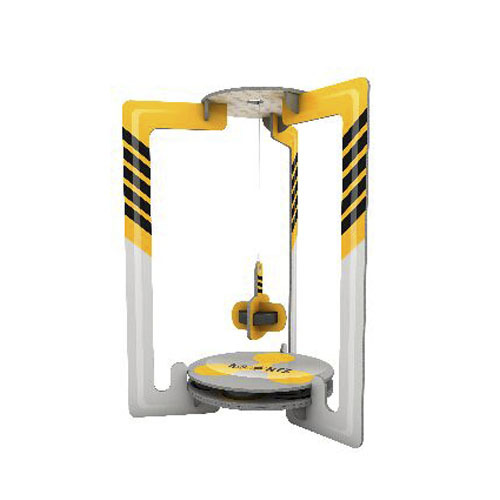 Explore the science of magnetic force and learn how its power can be used to keep the pendulum moving in a chaotic system. Can you guess what its next move will be? Easily assemble this chaotic pendulum without tools from strong, pre cut durable and recyclable cardboard parts, string and magnets. Swing the suspended magnet, and watch the chaotic movement unfold. This 17 piece DIY kit includes an instruction leaflet explaining the history of the pendulum and its use, and suggests further ideas for fun learning. How Does it Work? A single magnet is suspended over three magnets with opposing magnetic fields, causing the dangling magnet to swing away. As the swinging magnet is brought back to the centre by gravity, it is repelled again by the magnetic field. The triangular arrangement of the magnets on the stage keeps the suspended magnet in constant and unpredictable motion.